2 years and 4 months, had passed since the first VoM winner was announced on April 2010, then followed by the first BPoM winner announced on July 2010. In the period we had received lots of support from cheerleaders and cheerleading teams, so please allow us to thank everyone for your support in the past 2+ years! A total of $3,596 cash prizes had been given out for VoM and BPoM. 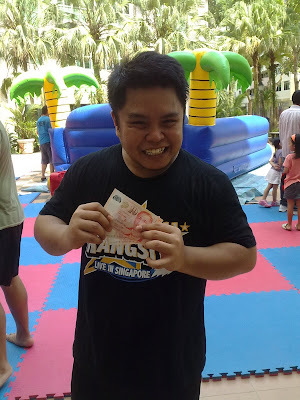 We hope that the cash prizes given out have benefited our cheerleaders in one way or another! We had a great run during this period, where I personally got to meet many new faces and also new teams. I felt it was still a great initiation in Singapore cheerleading scene. 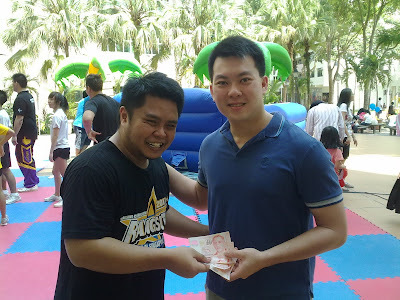 I do hope to see more individuals coming out with new initiatives to encourage and boost the cheer scene more (great example is by Ochi who did his 5 rep challenge). 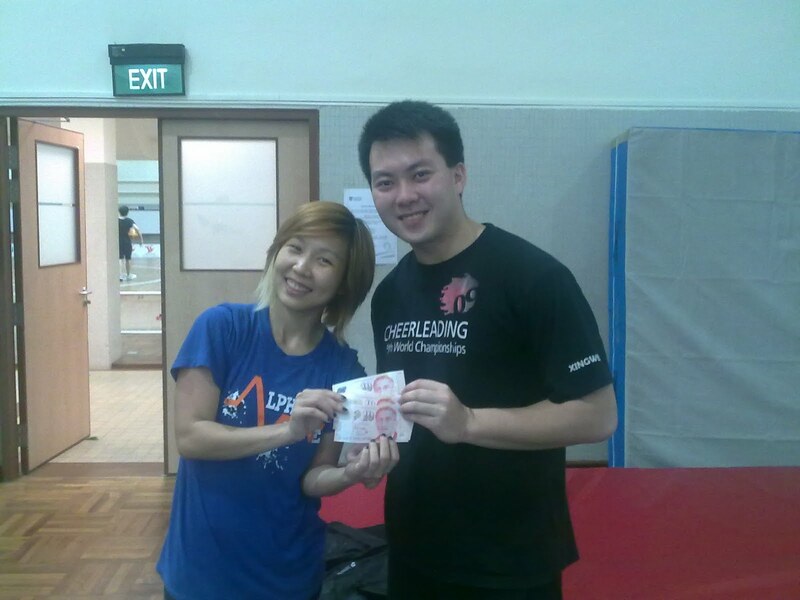 Singapore cheerleading scene needs more collaborative efforts and support for each other. One who does not support will never get support. For me it was a sad decision to make, to stop VoM totally, on XWonder 6th Anniversary (05 August 2012). Today marks another transition of my life. Whilst VoM and BPoM had been able to reach out to many cheerleaders out there, there are still some pockets of the market that we cannot reach out to, plus everyday new cheerleaders come onto the scene that do not get to know about VoM and BPoM. Yes we do still have new cheerleaders participating in the contest, eg. 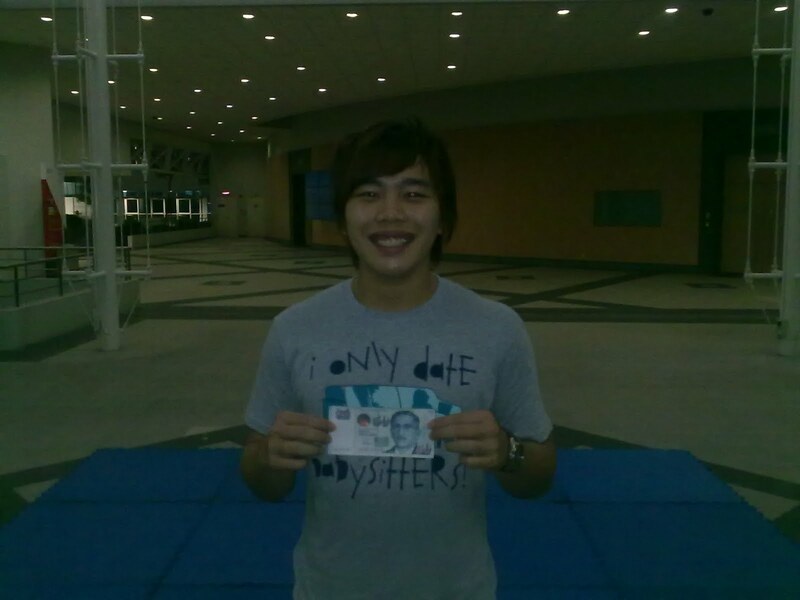 Jeric who just won the last BPoM, but we felt that the reach is still not far and fast enough. I still have a dream in cheerleading that I had not fulfill, but I know I will get there one day. 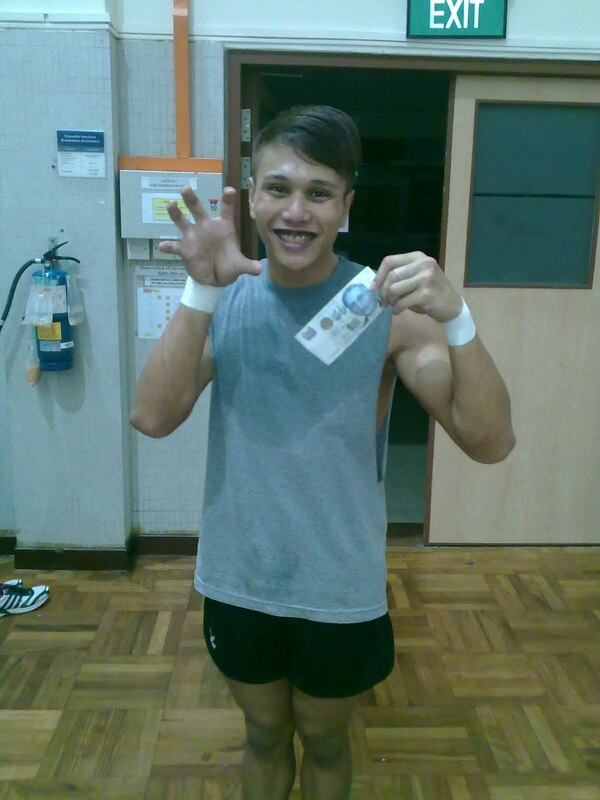 I will continue to give back to cheerleading even though VoM had came to an end at the moment. I will think of other ways. For now I shall put XWondercheer aside for the moment while I fight on other fronts to help cheerleading. Something great which I felt will make a big difference for every cheerleader in future. You can read about it in depth in my next post, the last and concluding post. 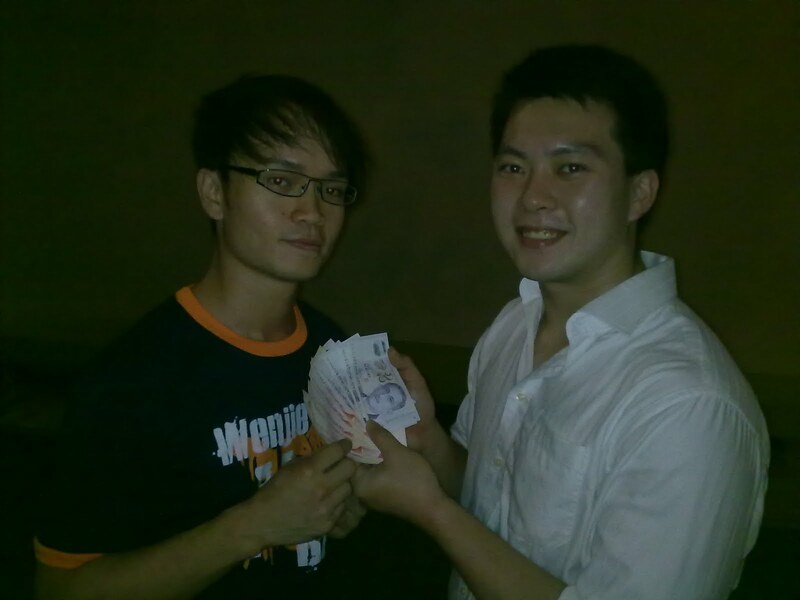 While Xingwei and I continue to be supportive of the local cheerleading scene, we have come to a unanimous decision to temporarily cease giving out cash prizes until further notice. 2) To reward young and deserving cheerleaders continuously for their passion and commitment to the sport. Xingwei and I have been working very hard to achieve both (1) and (2) over the past 2 years. However, we have noticed that VOM and BPOM is no longer to keep up with its modus operandi : which is to continuously reach out to the younger generation of cheerleaders in Singapore. As such, we have decided to continue to save up (yes we really believe in giving back to the cheerleading society) until we are able to think of a better idea as to how we can achieve the said agenda. We would like to hear from you. If you have any ideas on how we can build on our existing template to achieve the intention (1) and (2) that Chaang had pointed out, do write to us! $100 WILL BE GIVEN FOR EVERY IDEA YOU CONTRIBUTE THAT IS SUBSEQUENTLY IMPLEMENTED BY US! Until then, both of us will continue to be cheering for cheerleaders in every way possible. We believe everybody can make a difference. We believe your ideas can too! 2. I reserve the right to roll over the prize to the next month if there is no deserving winner for each month. Details of challenge: Record/make/create a personal video of minimum 10 Secs; of anything related to cheerleading with yourself in it. It can be Gymnastics, Partner stunts, Jumps, Tosses, Cheer, Pyramids etc. You can also do video edits to add music or effects to enhance it. Then upload the video to facebook and tag me (Xwonder Estrella) in the video; it will be automatically be considered as an entry for the challenge (Please check the privacy option for who can see this as "EVERYONE"). I will watch and review all entries, then at the end of each month, on every 5th, I will announce the winner on this blog (my decision is final). Another very nice video showing the liveliness, energy and fun that cheerleading can bring out. Sometimes after going through tough competition trainings, some cheerleaders will forget why they joined cheerleading in the beginning. Let us always constantly remind ourselves why we are doing this, for the real love of cheerleading. 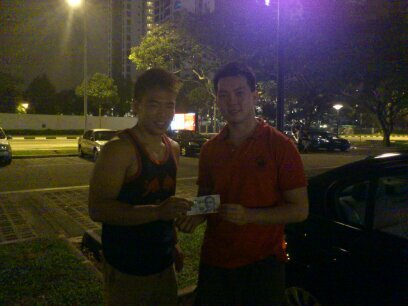 Zhaoming you won yourself $50. 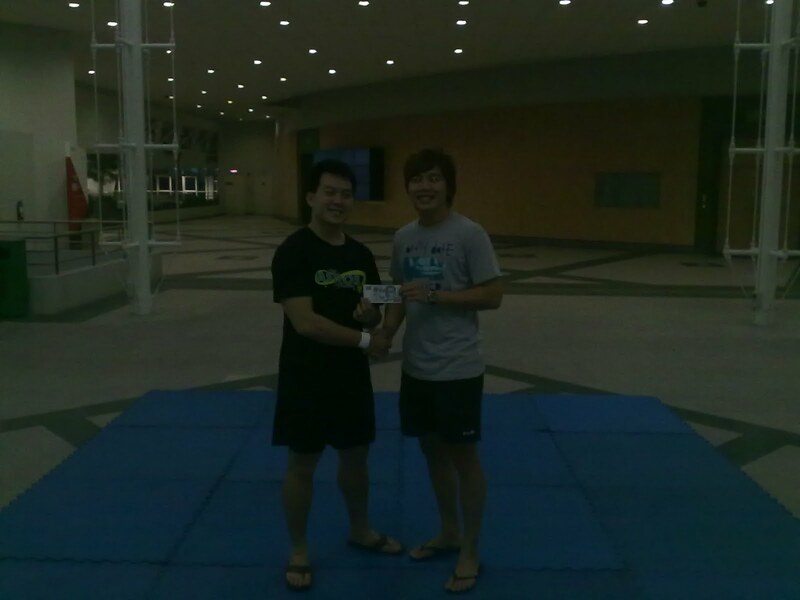 The winner for Jul'12 VoM is a video by Zhaoming winning himself a prize of $50.. 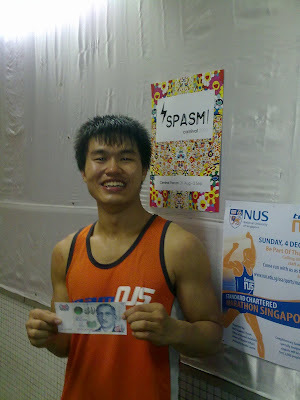 The winner for Jun'12 VoM is a video by Fairul winning himself a prize of $50..
A total of 5 entries in all. The video by Kahau; of him doing a awesome stunt sequence with Jasmine. Great video by Kahau once again, not only the stunts are great; the video is very nicely done too. I am really happy to see you gone so far together with Jasmine. I am really glad to be able to share your moment of happiness with you 2. Continue to live your dreams. Kahau you won yourself $50. 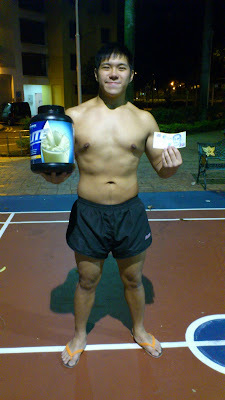 The winner for May'12 VoM is a video by Kahau winning himself a prize of $50..
A total of 6 entries in all. The video by Daryl; a video on Wildcards during SNCC. Great video by Daryl. Daryl never fails to capture the best moments with his photography and videography skills. Coupled with his amazing video editing and designing abilities you can always expect the a video with the best image quality and story behind it. Daryl you won yourself $50. The video by Winston on his partner stunting improvements. Great video by Winston. Everyone remember that in cheerleading there are many ups and downs, but if you continue to work hard, you will get to achieve what you want at the end of the day. Winston you won yourself $50. The winner for Mar'12 VoM is a video by Winston winning himself a prize of $50.. The video by Karen on Lions ATCI 2011 Journey. Once again fantastic video done on Lions ATCI 2011 Journey, summing up how they conquered and fight all their obstacles, the off days and the pain to put up a excellent show at ATCI. Karen and Fairul you won yourselves $50. 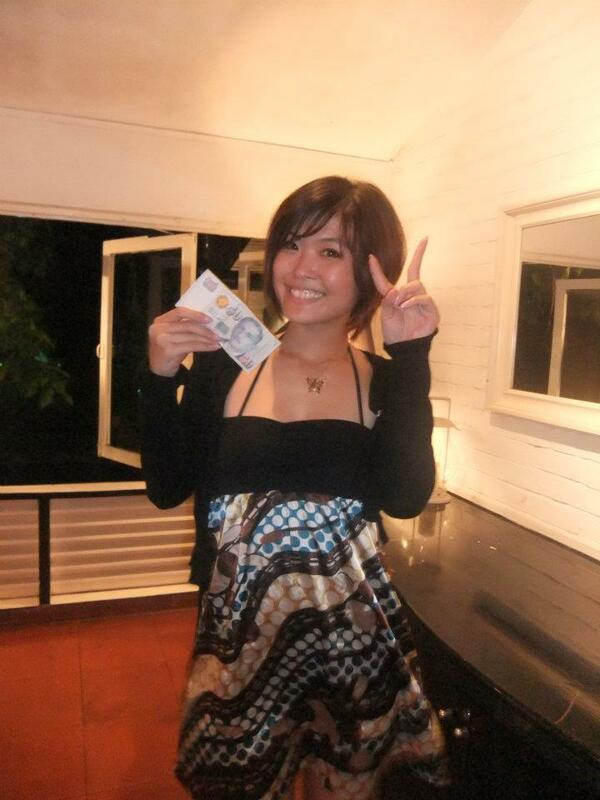 The winner for Feb'12 VoM is a video by Karen winning herself a prize of $50..
A total of 4 entries in all. Pardon me again for the late post. The video by Janyce of the compilation of the highlights during alpha verve Annual Cheer Camp. Really great effort by Janyce to do up this wonderful video of Alpha Verve Cheer Camp. Nice video to share with the cheerleading community. Janyce you won yourself $50. For Jan'12 VoM, our winner is a video by Janyce winning herself a prize of $50.. The video by Wenjie; a video to celebrate the wedding of YQ and BB; a compilation of all the wishes from cheerleaders and footages of their cheerleading photoshoot. Definitely a cheerleader's dream wedding come true for them, sweetened by this amazing video done by Wenjie. 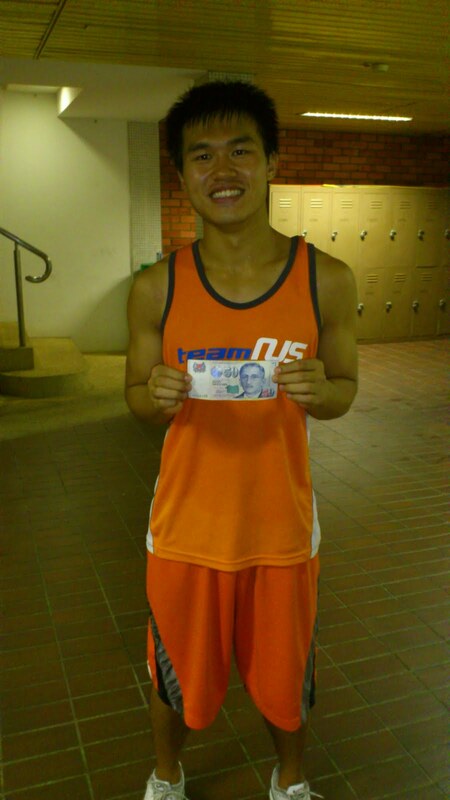 Wenjie you won yourself $50. The last winner for 2011; Dec'11 VoM is a video by Wenjie winning himself a prize of $50..
A total of 9 entries in all and many really great videos. Once again you all had given me a hard time to choose the winner. Pardon me again if I kept you guys waiting for the winner of VoM November. 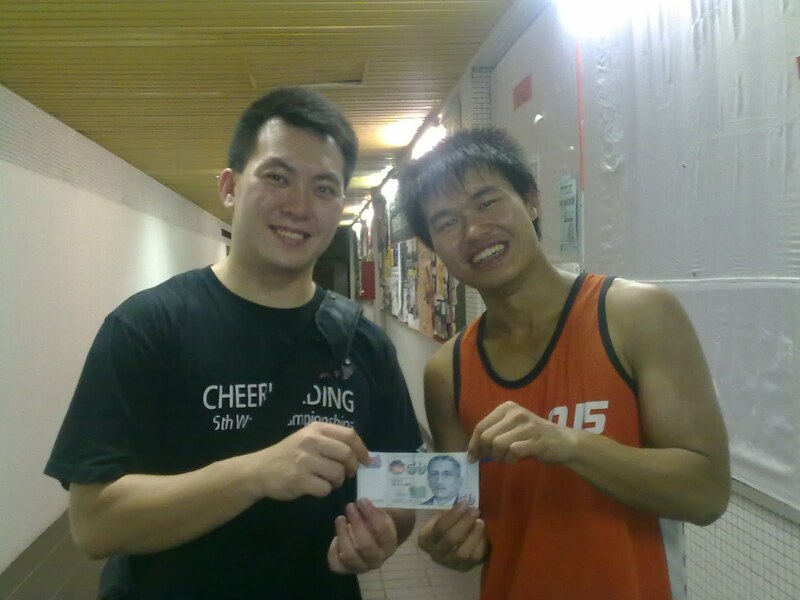 The video by Yirong on "Join Cheer". Great job Yirong for reposting this up and to Spectrum for creating this video. A fantastic video to give a little glimpse of what cheerleading is about, with interviews by the captain and vice captain of Hall 13 Cheerleading Spectrum. To me cheerleading is all that was said in the video and much much more than words can ever describe. If you want to know what I mean, Join Cheer!! Yirong you won yourself $50. For Nov VoM, our winner is a video by Yirong winning herself a prize of $50.. The video by Poh Kang and tagged by Fairul; a unique, fun, and extremely entertaining video, not fogetting the advance stunts done in the video without batting an eyelid. Great great stuff there shown by SP Gusto and presented to everyone in a light hearted and fun way. 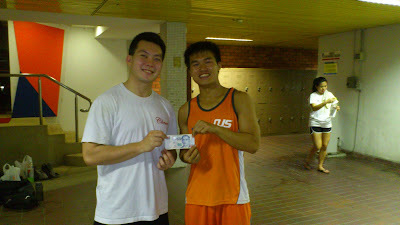 Poh Kang and Fairul you won yourselves $50. For October VoM prize presentation was a little special. 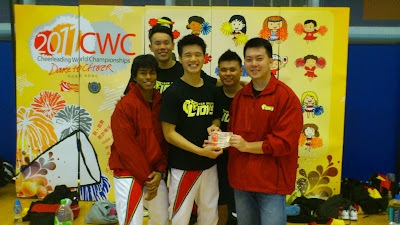 This was the first time we are presenting the prize overseas, in Hong Kong, during the recent CWC 2011. 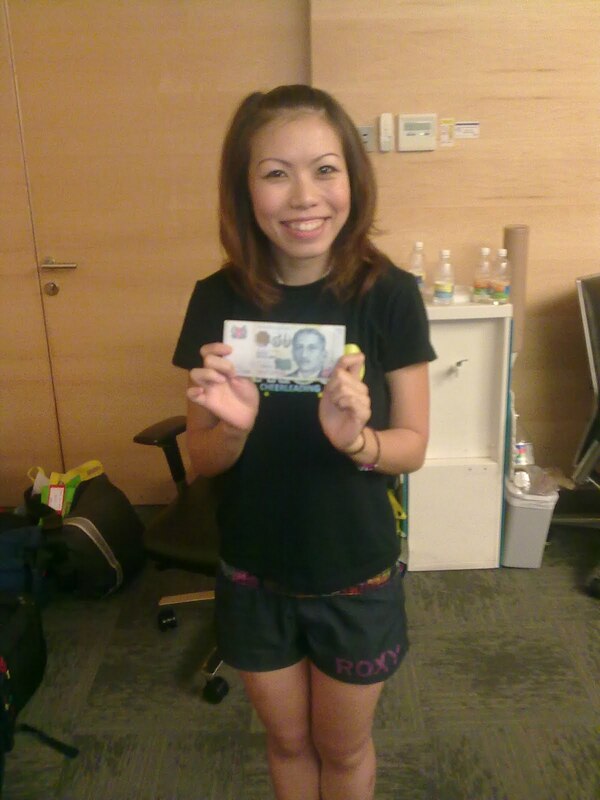 So this time round instead of giving out in Sing Dollars, our winner walks away $300 HKD, the approx equivalent of SGD$50. And the winner is the video by Poh Kang. Taken together with the SP boys in CWC. So which of the 4 entries is the winner of the VoM September'11.......? And the winner is the video by Li Jing on cheerleading in Alpha Verve. Congratulations Li Jing for a wonderful video done. You not only shown talent on the mats by off it as well. It is Alpha Verve's fortune to have you on the team. For Sept VoM, our winner is a video by Li Jing winning himself a prize of $50..
8 videos entry for XWonder 5th year anniversary. We always get more entries on special occasions. The video by Gary on his video of hands to hands pop to liberty. Once again I would like to thank Wildcards for inviting Kentucky cheerleaders down, each time they come to Singapore, everyone gets to learn new things, and this effect will trickle down a long way and translate to improved standards in SG cheer. This video by Gary showed us what we never thought of ever trying before, and that it can actually be acomplished by our very own cheerleader from Singapore too. It gives a this renewed belief in our own capabilities. This video won VoM this month for not just being another video, but something that brings about faith and the light in the tunnel for SG Cheer. Also for this month, it is XWonder's 5th Anniversary, we decided to throw in a little extra for the winner. Gary you won yourselves $50 and a 5Lbs protein powder. Thank you everyone for the continued support for XWonder as we celebrate our 5th year. Another long delay for this prize presentation. For August VoM, also our XWonder 5th year Anniversary Special, our winner walks away $50 and a 5lbs protein powder. The winner is non other than Gary (note when he won this prize in August, he was still the "Fat Gary" and now he is the "Fit Gary"). And I just cannot help but post a picture of Gary when he hit the Hands to Hands pop to Liberty which won him VoM August'11, just in case you guys forgotten how he looked like back then. For July VoM, our winner is a video by Fairul and tagged by Jay winning themselves a prize of $50..
Another month of solid entries from everyone; 9 entries in all. Once again I thank everyone who had supported VoM. Really pardon me if I kept you guys waiting for the winner of VoM May. The video by Eugene on the various different skills involving Tick Tocks. Eugene you won yourself $50. 10 entries in all, a record for VoM, the most entries to date so far. Such a feat is so fitting for this month; This month, April, is also the 1 year anniverary of VoM. Time has past so quickly and 1 year ago, we gave out our first prizes, VoM is now 1 years old. I sincerely thank everyone who had supported VoM for our inaugural year, where a total of 66 entries and $718. had been given out in total. And to add to that total, celebrating VoM's 1 year anniversary, we have decided to give out "special prizes" this month. So what's the special prizes? This month, other the the winner, we decided to give out 3 more prizes (just like last year during our first month) in no order of merit. So how much? Winner will win $80 and the 3 other prizes of $40 each for a total of $200 this month. The video by Vincent (tagged by Yvonne) on their group stunt journey to SNCC 2011. This video showed how they hard trained, how they overcome lack of venue, and even mixed their own music and made their own uniforms. They do not even have a coach to teach them and help them give countings that they had to record their own voice. It really sums up how their passion for cheer, desire to compete overcomes everything. Compared to establised teams in cheerleading, Vincent and friends had no funding, no resources, no coach, no venue; I know how important those are, and for them to do it without those, is really no easy feat. It was really hard to come up with the winner for VoM this month, and you guys deserved it. Hope that it can be a small motivation to all of you, keep cheering. Vincent and Yvonne you won yourselves $80. Alright now it is also time to announce our 3 other special prizes, in no order of merit. This being the 1st year anniversary of VoM, and also not only with the number of entries, but also the quality of the entries, I decided to increase the total amount of prizes for this month. I really had a long and hard time deciding on the winner, but I also want to reward the others for putting in so much effort as they are all very well done, so I increased the number of prizes for this month. Firstly Felicia from Wildcards for this video on Wildcards SNCC 2011 journey. Once again, a very heart touching video of Wildcards, detailing the sweat, blood and tears along the way to SNCC 2011. 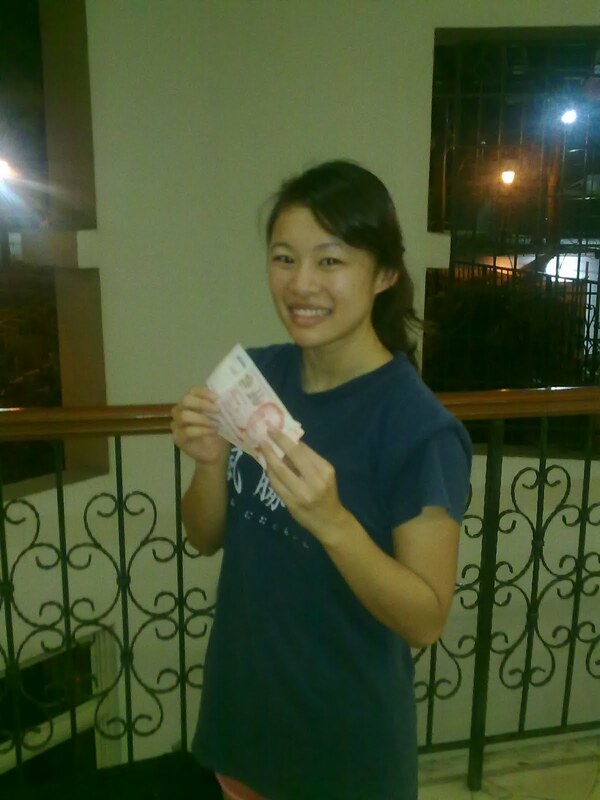 Congrats to Felicia once again and you won yourself $40. For the next $40 it goes to the video posted by Karen (tagged by Jay) from Legacy for their video. Another 1 of the video showing the road to SNCC 2011. What I liked most about this video is some of the effects used in it (like the fast forwarding effect), the way parts of the video was filmed (the lip sycning to the song). Congrats to Karen and Jay and you won yourselves $40. And for the last winner of the special prize, it goes to Wenjie (tagged by Harlis) for their video detailing Denvers journey and also as a promotional video for their recruitment drive for the upcoming seasion. Denvers Cheerleading Team, the only open category team to joined both SNCC and SEACO, and the video depicts down the journey wonderfully with sniplets of training and also of the competition. 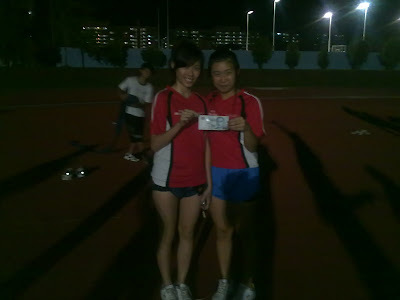 With this, it sums up VoM April'11 and also brings a sort of a closure to Nationals 2011 and everyone let's work hard for 2012. Congrats to Wenjie and Harlis and you won yourselves $40. A big round of applause to everyone, everyone who submitted the entries and also to the winners, not only this month, but for the entire year of support. Do continue to support VoM and contribute to SG cheer. I knoiw this is pretty late, but finally I got to present prize for the winning entry of April VoM, a video by Vincent and tagged by Yvonne, winning themselves a prize of $80..
And the last of April VoM presentation, a video by Karen and tagged by Jay, winning themselves a prize of $40..
Li Jing for his video on Alpha Verve and some of the highlights and acomplishments this season. Once again an amazing video done. A video by Li Jing from Alpha Verve. Another first video from someone new to VoM. Li Jing I never knew you are so talented in this area too. I loved the effects used in the video. Alpha had come a long way this season, you all were not defeated when things do not go our way, but instead pick ourselves up and did it even better. Because of the ordeal, each an everyone of you became a better cheerleader. Really hope to see all of you stay together for the next session and build on what we achieve this year. 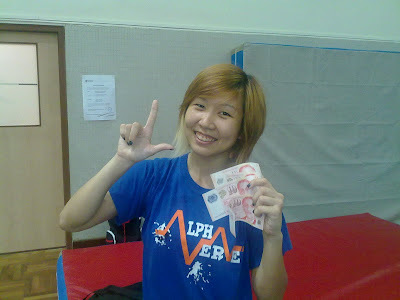 Li Jing you won yourself $50. With this month's VoM, we have completed an entire year, the first full year since the introduction of VoM in April'10. A total of $718. had been given out so far. I promise the next year to be even greater. Come on guys what are you waiting for? Be part of the action and get paid to cheer. This gotta be the most delayed prize presentation for VoM ever. Though I see Lijing quite often at trainings but it just always slip my mind till I was reminded that day. 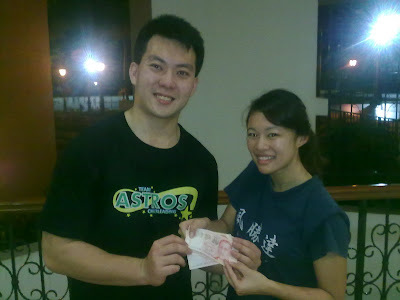 And this is for March VoM, our winner is Lijing of Alpha Verve winning himself a prize of $50..
Elvie Na of KR Steppers for posting her video on their training for ATCI 2010. I always had this thing about videos that documented the hard work, the endless trials of a team's journey before a competition; the success at the end of the day after countless failures. It is always sweet to have individual success (as a few videos showed this month), but it is always the success of the entire team that is the most meaningful to me, the common bonds that were built in the process, a memory that many shared together. This is what cheerleading is really about. Elvie Na you won yourself $50. Big thanks to everyone who had supported in 2010 and hope that many more will continue to support VoM in 2011. Really looking forward to even more awesome videos from everyone. Prize presentation of VoM and BPoM together for the very first time. 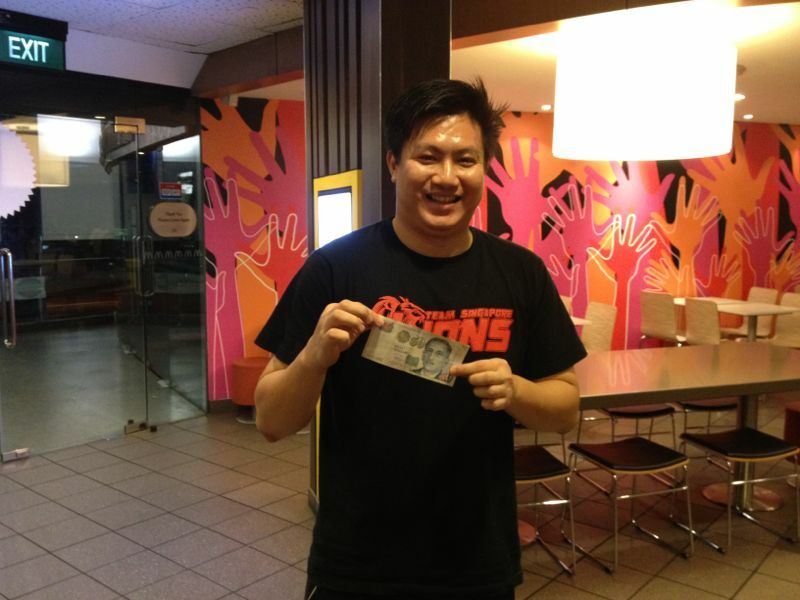 Ochi is both the winner of VoM and BPoM of month of December getting himself a total of $100. 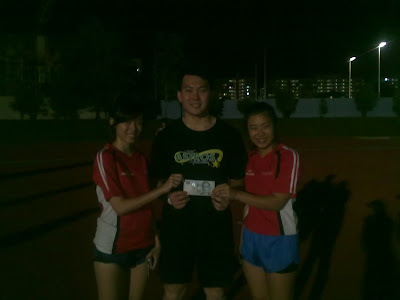 Kerry for his video on the toss cupies at RWS, and also to Ruth for tagging it. A simple but nicely done video that showed the 4 tries taken to get a good take for 3 toss cupies. The background chosen for the video was excellent as well; managed to capture the entire Universal Globe. Nice job on the commentaries as well to provide a much needed humour to my hectic life. 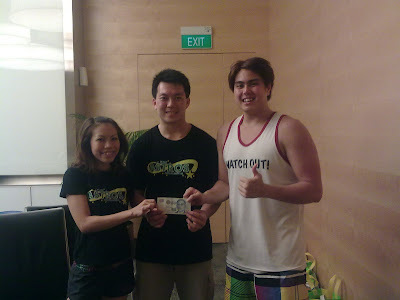 So for this month's promotion, with the video at 59secs, Kerry and Ruth you 2 won yourselves $50. Although I was pleased with the number of entries this month, I am hoping to see more entries from a wider circle of cheerleaders and not just cheerleaders who know me. If you hear of VoM, do not hesitate to join; it is open to everyone even if I do not know you. A very nice video of the progress of training for their routine. It shows the failures but also the never give up spirit. 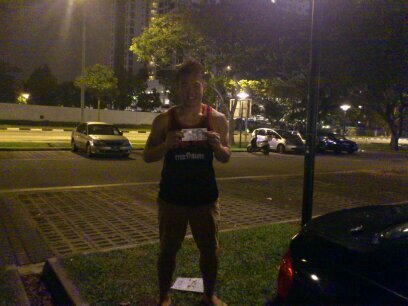 Jiayou for your Partner Stunt competition, and show them what Singapore is about. The competition is to be held this month, on 17th and 18th, please show them your encouragement and lend them your support. The winner of Video of the Month August goes to Toh Jiahui. Jiahui won herself $80. Once again, this video shows that hardwork is the key for cheerleading, that we fail all the time, but those who learn from the countless failuers and preservere will ultimately succeed. Congratulations to Zhaoming (and Andrew, Jiahui - Zhaoming will treat right? ), you have won $50. The winner of Video of the Month July goes to Luo Zhaoming. This was a little back dated, due to Zhaoming's commitments overseas for 1 month. He won himself $50. Some pictures of the prize presentation. That's all folks. This video is really funny and entertaining. It shows how cheerleading should be like; fun and high spirited. A great bunch of fun loving Gusto cheerleaders shown in the video. Also a very nice rewind done by Weihan and Ainslie. After watching the video, it really brings me back to the happy days when I cheered, and makes me wanna wish to go back and live all that fun again. And of course congratulations to Yiqian (and friends - I am sure you will share the prize right? ), you have won yourself $100. 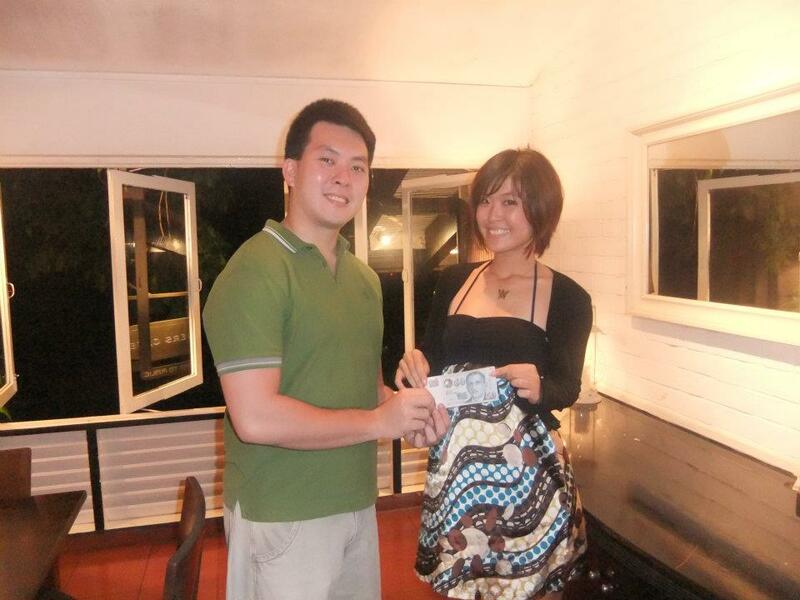 The winner of Video of the Month June goes to Toh Yi Qian of Gusto. Yi Qian won herself $100. Some pictures of the prize presentation. Very nice video made by Andrew that showcases himself trying some really elite stunts. Great job put in by his flyer Yvonne too. What I really liked about the video is the never say die attitude; you can see that they had tried doing that toss cupie liberty for more than 1 training from the different shirts they wore. Not being afraid to show your failures and keep working on them is an exemplary quality to show to everyone. Good job for incorporating humour into the video as well. 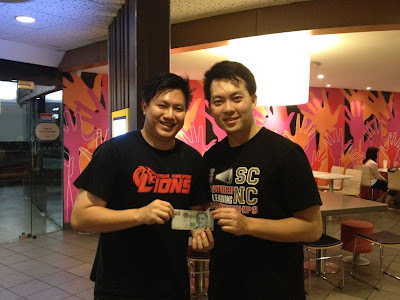 Congratulations once again Andrew, you won $50. I have an announcement to make: The prize for VoM Contest June'10 has just been increased from $50 to $100. Thanks alot to Andrew and Yvonne for giving up the chance to take home the prize they won for VoM Contest May and re-contributing it back to VoM Contest June. "Our aim is to promote cheer and stuffs, money is secondary and a bonus"
Salute to them for having the right mindset and attitude towards cheerleading. Their video will automatically be reconsidered as the 1st entry for June. So people out there reading this, start posting your videos; and not make it that easy for them again. It took us a while to come up with the winner, it was tough and we almost wanted to give a tie for the champion (again). Haha. But nah, we are not going to do that to you guys again. So without further a do, the winner for the first ever Video of the Month Challenge goes to *Drum rolls*....... The winning video is posted and Tagged by Ken from Wildcards!! This video shows team work, hard work during training, and also team spirit and bonding off the mats. The video also featured many great skills and stunts that will serve as a reference for many people in future. The music and clips selection made it very interesting to watch too. 1 thing that I like personally about this video is the fact that they released this video, with clips showing what they are going to do for Nationals, a couple of days before the competition. I do not believe any other teams did this, and this shows their confidence level and readiness for the competition. 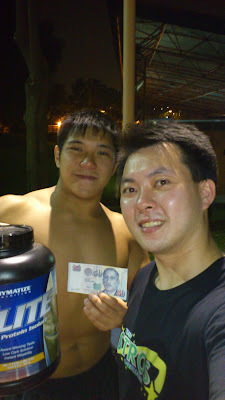 Congratulations once again to Ken, you have won yourself $50. 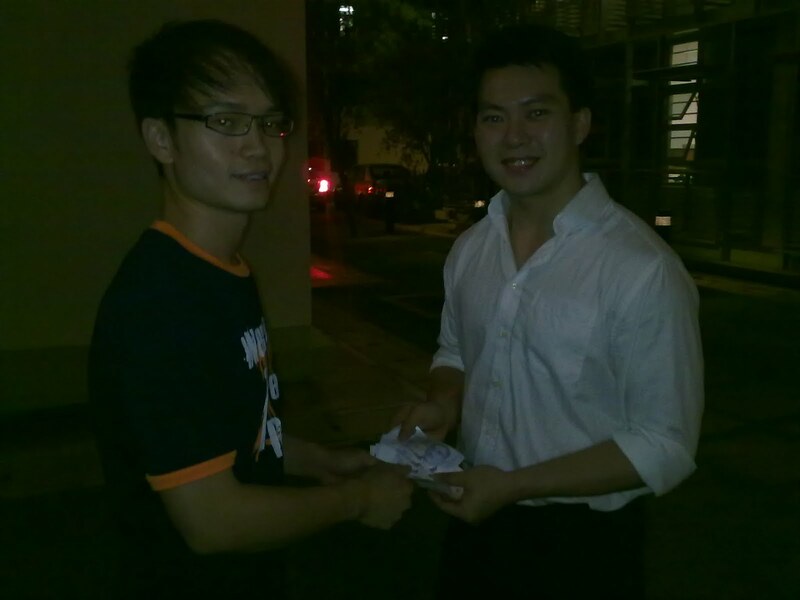 Alright, now some may be asking what about the other $50 which was not given out as Ken's entry was made after 14 March (after the early bird promotion)? Ok. I thought about bringing forward the extra $50 to the next month, but upon further deliberation and taking into consideration of the good videos and support this first month, we have decided to give away 2 more special prizes of $25 each today. The next special prize we have decided to give is to Jay from Legacy for this video.